Gamers will be able to purchase select titles for as little as $0.59 cents during the DRM-Free GOG's Time Machine Sale. GOG is no stranger to big sales. In fact, the online retailer offers hefty discounts on portions of its stock most every weekend. That being the case, fans of PC games, old school and new school alike, may want to hop over to the digital distributor in the next few days to take advantage of its newly announced DRM-Free Time Machine Sale, which will feature the site's biggest discounts to date. The sale, which aims to "celebrate the pioneers of the medium and the subsequent acclaimed classics," will feature heavy discounts on a variety of titles from the various eras of the industry's history. Customers will have the option of lengthening or shortening sales by voting for or buying sale game. The promo will see some prices slashed as low as $0.59 and will include games such as Wizardry, Deus Ex, Legend of Grimlock, The Witcher and Spelunky, amongst others. Gamers eager to open their wallets for the sale, in turn, won't have to wait long. 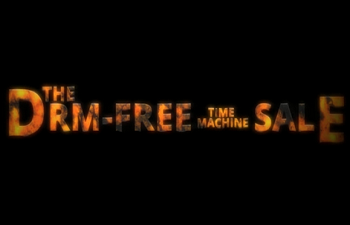 According to a release from GOG, the DRM-Free Time Machine Sale is set to launch tomorrow, January 28th at 9:00AM EST. Suffice it to say we'll be keeping an eye on the site to see the full extent of its offers.